Getting involved with the Chemistry Map of Scotland. We hope that this activity will be an excellent fit with Curriculum for Excellence, encompassing as it does, Chemistry, Geography, History, Art and design etc. Members of the Scottish Local Section Committees will all be happy to help schools if they have trouble finding suitable subjects. Multiple entries will be allowed but no more than three per school. The activity will be suitable for a range of age groups from P6 up to S6 levels. 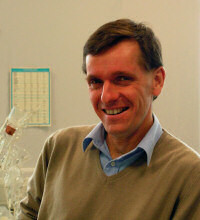 † The Chemistry Map of Scotland is dedicated to the memory of Dr Nigel Peter Botting (1962-2011). Nigel was a Senior Lecturer in Chemistry at the University of St Andrews until his untimely death from kidney cancer at the age of 48. He had a big presence in Chemistry Education in Scotland and was well known to many teachers and pupils. Every year, he organised the National Scottish Meeting for Teachers of Chemistry and the Scottish Council of Independent Schools Chemistry Masterclass, and hosted the St Andrews Salters' Chemistry Camp, as well as giving various demonstration lectures and helping school pupils with their Advanced Higher projects. He also served on the Scottish RSC Education Committee. As a long term member and, latterly, Chairman of the Tayside Local Section of the RSC he organised the annual ChemBus, bringing exciting Chemistry to S2 pupils in schools across the region, the Top of the Bench Chemistry quiz competition, Chemistry at Work - where school pupils meet people from the Chemical industry - and the RSC Christmas lectures. He was a key figure in the establishment of the Chemistry Map of Scotland project.